Valentine, Texas in Jeff Davis County is not a ghost town, but is currently a shadow of the village it was during its brief heyday. It was founded on February 14, 1882 by a Southern Pacific Railroad crew. Trains began to run the following year and it added a post office in 1886. For many years, the Southern Pacific Railroad maintained a large roundhouse in which they serviced their railroad engines running between California and Chicago. With the railroad business, the population of Valentine briefly swelled. One Southern Pacific employee was Dr. George Graves. He was born December 22, 1880 in Hurst, Pittsylvania County, Virginia. His secondary education included pharmacy, dentistry and medicine at Sewannee, the University of the South, in Tennessee. Upon graduation, jobs were hard to find but in 1903 a friend of his helped him locate a job as a physician for the Southern Pacific Railroad far out in remotely located Valentine, Texas. Shortly after moving to Valentine, Dr. Graves was introduced to his future wife, Sarah Jenkins, at a ten day cowboy revival in nearby Paisano, Texas by Josephine Jenkins Truett and her husband, pastor Dr. George Truett who led the revival. The young couple was married in 1910 as Dr. Graves continued to serve the employees of Southern Pacific and nearby ranching families. In addition operating his medical office, Dr. Graves established a drug store to secure a supply of medications for his patients. One winter night during a blizzard, Dr. Graves was awakened by knock on the door. A local cowboy had called to ask Dr. Graves to attend to a sick rancher, and he obliged. However, as a result of this event, Dr. Graves came down with a bad cold that progressed to pneumonia. Dr. Graves had suffered from tuberculosis in his youth and he died from complications of pneumonia on June 7, 1915, leaving a wife and young son. Southern Pacific eventually phased out the repair facility and one by one the railroad employees left. At present it is home to a few hundred residents in the town and surrounding area. However, the Valentine postal address is always popular this time of the year. People like to mail their valentines bearing the proper postage to the Valentine Post Office where employees and volunteers affix cancellation stamps similar to the one above. 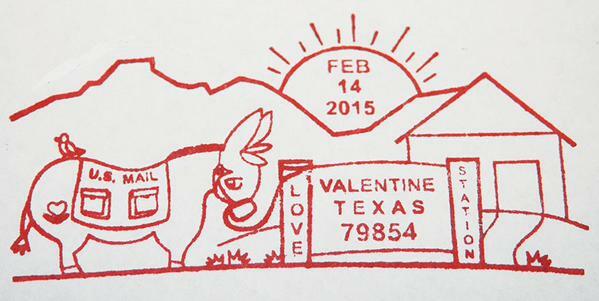 Each Valentine’s Day has a unique stamp. It is reported that some 10,000 valentines are sent out each year using this procedure.